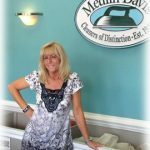 At Medlin-Davis Cleaners, we understand the time and investment you’ve made selecting your wedding gown. Once the big day is over, it is important that you take proper care of your gown to ensure its ageless appearance for future generations. When you bring your gown to us, we will thoroughly inspect the gown in your presence to identify any stains or damage that may have occurred during your wedding day. We then repair any damage, pre treat any stains and clean your gown based on our over 70 years of experience. We then thoroughly inspect your gown, hand press it and invite you to view it prior to its preservation. We recommend two forms of dress preservation. Storage Chest: The storage chest is made of all acid free material and is designed to keep out light, moisture and insects. It has a viewing window and storage space for your veil, gloves, shoes and other mementos. It is not sealed allowing access to your gown. It is then inserted into a sturdy cardboard box with a handle that is excellent for storage. Muslin Garment Bag: The garment bag is made of 100% muslin with ribbon ties up the front. It is designed for those dresses that will be stored hanging. The dress will be on a padded hanger with the train supported and bodice protected by loops attached to the hanger. No matter what preservation method you choose, it is important that you store your gown in a temperature controlled environment and out of sun or interior lights. You have chosen just the right gown for you — now choose the right care for your gown. 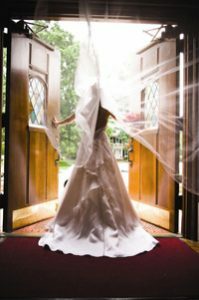 To help lower the cost of your wedding and to make your gown look its best, Medlin-Davis Cleaners will press your wedding gown for the wedding portrait, or the wedding itself. Bring the gown back to us to be cleaned and preserved after the wedding and we will refund the original cost of pressing. Please take time to submit the form below and we will gladly send you a $25.00 off Gift Certificate for your interest in our services..
To remove lipstick from dark fabrics, grab a piece of white bread and remove the crust. You don't have to forgo a sandwich; you can use the heel of the loaf -- no one likes that piece anyway. Wad up the soft center and rub it gently on the stain until it picks up all of the lipstick. Sweep away any leftover crumbs with a clean, soft-bristled brush. Whether it's on work shirts or Sunday best, staining around the collar can be easily vanquished with a touch of something you're pretty much guaranteed to have in the house -- shampoo. Just pour a little shampoo -- any shampoo will do, even the inexpensive, generic kind -- onto the collar, rub the collar together to work the shampoo in well, and rinse thoroughly. Then launder as usual. Before you put those summer clothes into storage make sure you get them cleaned. Especially any item that has a stain. Stains will attract insects and they will cause damage to the clothing. Mistakes we can make Mistake 1: Rubbing stains furiously; This can make the stain worse and possibly wear away the fabric. Instead, be gentle and methodical. Treat the stain as soon as you can; the less time that elapses, the more success you'll have. And always use a white cloth so that colors can't transfer. Dab, rather than rub, working from the outside in to keep the stain contained. Want to dry your shoes and don’t have a shoe drying rack for your Dryer? Tie your shoe laces together so the knot is at the end. Then close the laces in the door with the knot on the outside and shoes hanging in the dryer....no more loud noises. Wash in Cold Water: When you switch from using hot or warm water to using cold water, you reduce the energy needed for heating the water. ENERGY STAR estimates that almost 90 percent of the energy used when washing clothes goes to heating water. Removing paint from children's clothes:- Most paints children end up playing with are water soluble and will easily come out in regular washing. The acrylics and other types of paints are better left to professional cleaners who can get the garments clean and flush out all of the stain removal chemicals used to achieve that end. Any residual stain removal chemicals can harm your child’s skin, so it’s best to leave that kind of work to the pros - us. Salad Oil Stain? This is the worst because it can yellow with age if not removed. Cover a big spill at the table with absorbent powder. Shake off after supper. Apply a mild detergent mixed with household ammonia, ASAP. Wait 5-10 minutes and wash in the hottest water safe for the fabric. Red Wine stain? Lightly touch with an absorbent towel to draw up the liquid or put paper towels under the spill. Blotting can spread the stain. After dinner: rinse in cool water; treat with a mild detergent and white vinegar. remember to dab the stain, never rub as this could cause damage to fibres and color loss. Our mission is to provide you, the customer, with the very best services in the dry-cleaning industry at a fair and reasonable price. Visit one of our store locations in Raleigh, Apex, Cary, Chapel Hill and Holly Springs.